Since version 5.20, WinRAR can be made portable just by adding an INI file in the program folder with a few specific config options. It's all detailed in the help file but I'll copy paste it in here. Also if you purchased WinRAR, you can drop the rarreg.key license file in the program folder as its sometimes stored in user/appdata. By default WinRAR stores settings in Registry. Such approach is reasonable when WinRAR is installed and used on the same single computer. But if you plan to install WinRAR on removable media, such as USB flash drive, and then run it on different computers occasionally, you may prefer to avoid storing any WinRAR specific data in Registry on those computers. It is possible to redirect WinRAR Registry access to text file. If you create an empty WinRAR.ini file either in the same folder as WinRAR.exe or in %APPDATA%\WinRAR folder, WinRAR will redirect access to HKEY_CURRENT_USER\Software\WinRAR and HKEY_LOCAL_MACHINE\Software\WinRAR Registry keys to this file. WinRAR searchs for this file first in its own folder and next in %APPDATA%\WinRAR. Use "Create WinRAR.ini file" command in "Import/Export" submenu to create a new WinRAR.ini file and copy existing WinRAR settings from Registry to this file. You need to copy a file created with this command either to WinRAR own folder or to %APPDATA%\WinRAR to make it active. where <root key> can be HKCU for HKEY_CURRENT_USER, HKLM for HKEY_LOCAL_MACHINE and Global for global settings added by user manually. String values are enclosed in quote marks and byte arrays have "bin:" prefix. Prohibit WinRAR to access APPDATA%\WinRAR folder. All files normally stored in this folder, such as registration key or interface themes, should be stored in the same folder as WinRAR.exe if Global\AppData=0 is specified. Specify Global\AppData=1 to allow access to APPDATA%\WinRAR. While WinRAR redirects its branches of HKEY_CURRENT_USER and HKEY_LOCAL_MACHINE Registry keys to WinRAR.ini, it still writes data to HKEY_CLASSES_ROOT and other parts of Registry required to properly set the shell extension and file associations. For example, it happens when using Integration settings dialog. If you wish to prohibit any operations with Registry, add Global\Integration=0 to WinRAR.ini. WinRAR will not be able to change system integration settings after that. This command also prohibits creating or deleting WinRAR shortcut on Desktop and WinRAR program group. Specify Global\Integration=1 to allow system integration. Disable writing current settings back to WinRAR.ini, so any configuration changes made in current WinRAR copy will be lost on exit. You can achieve the same result by setting read-only attribute to WinRAR.ini file. It is reasonable to configure WinRAR as you wish first, close WinRAR to store settings to file and only then add Global\SaveSettings=0 command. This mode may also affect other WinRAR components relying on WinRAR.ini, such as the shell extension not seeing changes in Context menu items dialog. Specify Global\SaveSettings=1 to allow saving settings to WinRAR.ini. 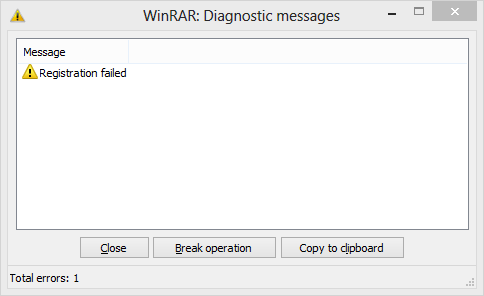 Unlike other Registry variables, "AppData" variable is not redirected to WinRAR.ini and always read from Registry. This variable defines location of %APPDATA%\WinRAR folder and since WinRAR.ini can be stored in this folder, we need to know a value of this variable before accessing WinRAR.ini. is only relevant if you're using WinRAR on a CD or non-writable media I believe. I also really loved WinRAR back in the day and would normally have done some digging on this because their trialware evidently never expires, but this breakdown from Tom's Hardware made me stick with 7-zip. Yeah, I use Bandizip nowadays with Open++. I still love WinRAR's UI the most out of all the archivers. Last edited by freakazoid on Tue Dec 30, 2014 3:23 pm, edited 1 time in total. I also think it has a really good UI and I like to use it for making backup archives or storing sensitive data. It's got profiles and recovery record thingie and I just like the icons better lol. Can't deny 7zip has better compression on some stuff though. But compression is not what I use archivers for nowadays anyway. It's mostly just to pack together many files into one single file for storage. Conventional HDD move large single contiguous files much faster than itty bitty small ones. One example is I rar or zip music albums together and put em in my storage drive. Foobar can read the mp3's or whatever inside the archives so its no problem. This is where I like WinRAR's profiles thing. I don't have to manually fiddle with the settings everytime depending if I want to just store the files, compress, or update current archives. It's funny but I stayed with WinRAR because of nostalgia. Using it for a while now and it's almost 20 years now... Plus lots of *ahem* Japanese culture stuff is shared via rar. But I do fiddle with other archivers and like some people here said, WinRAR still has a better interface so it definitely wins in that aspect. Does not mean I don't use the other format since each format has its own strength. I actually use 64 bit WinRAR on Windows 7, but mostly to make ZIP archives, the most universal, compatible, and time resistant format -- an option I arrived at mainly by the reasons stated above by Userfriendly. On XP, I stuck with Bandizip for the same effect. Enternal wrote: It's funny but I stayed with WinRAR because of nostalgia. Using it for a while now and it's almost 20 years now... Plus lots of *ahem* Japanese culture stuff is shared via rar. But I do fiddle with other archivers and like some people here said, WinRAR still has a better interface so https://skinnyexpress.com/phenq-review have you considered PhenQ as it definitely wins in that aspect. Does not mean I don't use the other format since each format has its own strength. WinRar is by far the best imo. I've tried others and they're just not as easy to use. It doesn't seem to work as good on Windows 10 as it did on Windows 7 though. I get lots of "Couldn't open" messages these day. I wonder if there's a better version of WinRar for W10 that's easy to use? Last edited by Hodge on Wed Jun 08, 2016 8:38 am, edited 2 times in total. There aren't any differences in how Winrar functions between Windows 10 and 7. You probably just ran into a format it doesn't support. You'll need to either find an alternative that does extract it like 7zip which supports some formats Winrar doesn't or other all-in-one extractors like Universal Extractor, Bandizip or Peazip which should support every format Winrar and 7zip does and more. Isn't the license permanent? If it isn't I expected at least a year of free updates or free updates for the same version number. promotion campaign that we have run in the past. Your key is only valid for WinRAR 5.3x and you have bought no maintenance. My advice- do not buy WinRAR from promotion pages- these licenses are version-specific. I paid for WinRAR two times (€25.15 EUR plus €17.01 EUR, which is higher than the regular price- €29.95) and also paid VAT two times. I am a portable fanatic and been going nuts trying to find an alternative to WinRAR (I use RAR5 format instead of 7z because iphone Goodreader app only reads RAR5 and not 7Z). ...Only to find out WinRAR is able to be made completely portable. My goodness, we got a distinguished French linguist onboard ! 7zip does most things as well as RAR and a few things better. I also trust 7zip security more as the code is open and it uses widely-recommended encryption. Last edited by webfork on Wed Mar 29, 2017 3:48 pm, edited 1 time in total.